ALF Appliance Dentist – What is the Advanced Lightwire Functional. How does the ALF Device Work? stimulate an increase in outward growth of the jaws. creates more space for the teeth to fit. creates more room for the tongue to fit and function properly in the mouth. creates a better fit of the teeth and a better bite. The ALF appliance can not only make your smile look better but it can also prevent many of the causes of TMJ, sleep apnea, orthodontic problems and postural problems. 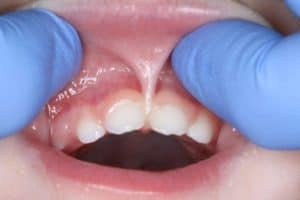 If your child breathes loudly, snores, clenches his/her teeth at night time, suffers from nasal stuffiness, these are warning signs of underlying problems. some children even have sleep apnea. Dr. Adams is a natural and holistic dentist by philosophy. He is also an ALF appliance dentist who has been treating kids and adults with advanced lightwire functional appliances for years. TMJ-TMD – teeth clenching issues is one of the leading causes of tooth loss. Nigh time breathing issues is one of the biggest causes of heart disease. “my job is to treat the hole body and not only repair and replace teeth but to also prevent future tooth loss by diagnosing and correcting the cause…” Dr. Adams sees patients in his Burtonsville office near Columbia Maryland and Silver Spring MD. Stop searching for ALF appliance dentist near me, and contact Dr. Adams for an Advanced Lightwire Functional consultation. How are ALF Appliance Results? 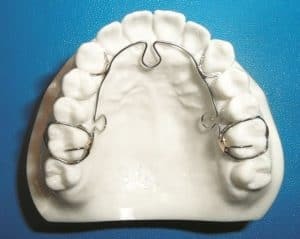 The ALF produces a light springy outward stimulus and in concert with proper tongue function, the perfect conditions for jaw development and growth are present. The main driver for jaw growth and development is the tongue. The tongue during normal function such as talking, swallowing, etc., puts an outward pressure on the teeth and jawbones. In a growing child pressure on jaw by the tongue is the primary stimulus for jaw growth. When conditions such as tongue and lip ties are present, the range of motion of the tongue is decreased as is the pressure placed by the tongue on growing jaws. The biggest culprit in jaw under development and crowded teeth is tongue not doing is job and lip ties. Lip ties tighten the lips back on the teeth and produce a resistance to outward development of the teeth. Proper function of the tongue is pivotal in successful ALF treatment. Therefore treatment of tongue ties with tongue myotherapy or tongue tie release and release of lip ties is necessary for successful ALF therapy. In general ALF appliance results are superb. The ALF is the goto appliance for kids with crowded teeth, but it is also a great craniofacial device for adults who have minor tooth crowding and who could use some jaw balancing. The Vivos DNA is a much better appliance for adults who have TMJ, posture, headaches and sleep apnea problems. The DNA device produces more growth of bone in adults and enables the DNA appliance dentist to place the patient into a different bite and better treat TMJ pain quickly. ALF appliance therapy last 6 – 18 months. It includes a 3D xray, full evaluation and diagnosis, treatment plan, upper a lower ALF Appliances. The therapy includes monthly adjustments and visits to the ALF appliance dentist. The child must do their ALF therapy tongue exercises. The cost for the entire ALF therapy is all inclusive and the ALF appliance cost is $3500 – $6000 depending on the complexity of the case. Is the Advanced Lightwire Functional Appliance a Palatal Expander? The ALF dental device is really a palatal expander the uses the aid of a functional force – the tongue and chewing forces – in palatal “expansion” therapy. We are not sure where the word “expansion” came from in the world of dentistry, but is sounds scary…what really happens is targeted stimulation of jaw bone growth with the aid of natural function forces – the tongue. The tongue is the natural palatal expander. The ALF promotes a natural increase in bone volume and jaw space. The new space allows additional room for teeth to fit and the tongue to function normally. Successful ALF treatment in this regard is what prevents TMJ problems and sleep apnea in adulthood. 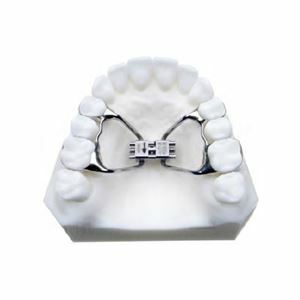 Braces, in our opinion, work well to straighten crooked teeth as long as there is enough room in the jaw. It is best to use have an ALF Dentist use an appliance to gain enough space in the mouth for teeth to fit and the tongue for function properly first. The if necessary, use braces to correct crooked teeth, spacing and other cosmetic issues. In our opinion, The ALF is a better appliance for correcting tooth crowding because the ALF creates room for the tongue and the teeth to fit in the mouth. The ALF also results in the jaw being the shape of the tongue rather than shaped as a wire or another appliance that does not use functional tongue forces. The ALF expansion stops when the tongue stops pushing outward on the appliance and teeth – that is at the time the tongue has enough room to function properly. As if it were magic, the human mouth is designed to be large enough to fit all the teeth and tongue – naturally when teeth have enough room to fit, so does the tongue. This is the way things were naturally intended to be. The ALF is truly a natural expander. What is an Advanced Lightwire Functional Appliance? In ALF appliance therapy the craniofacial dentist can slowly adjust the omega loops on the device wire to slowly improve the diameter of the ALF. By increasing the profile of the appliance, the result is a lightwire force of pressure and stimulation of outward and jaw regeneration. Promotion of a larger jaw creates more tongue space, more room for the teeth to fit better and more room for better night-time breathing. The ALF appliance uses light forces and the appliance is shaped like a mouth and tongue are shaped. A rapid palatal expander used a screw to do all the expansion and most of the time only expands in the back of the top maxillary jaw. The result can often be tipping of the teeth and a V-shaped mouth. The two main problems with Rapid Palatal Expansion: 1) expansion does not occur in the front part of the upper jaw 2) expansion is too fast and less bone may grow. Naturally there is tooth crowding in a small mouth. Crowding of teeth is usually treated as a cosmetic problem by an Orthodontist. Children who have small mouths and crowded teeth may have breathing problems through their mouths and noses and may sleep poorly. ALF experts can be hard to find because too much focus can be focused on straight teeth. Seeking treatment from a qualified ALF appliance expert has many advantages. An ALF dental professional or ALF orthodontist uses this appliance as his or her go to for tooth crowding. The ALF is an “Elgiloy” wire of 0.025” or 0.028”. The ALF aka. advanced lightwire functional has a high degree of flexibility. ALF can be adjusted to increase the size of the upper and lower jaws. ALF device was originally designed and created by Dr. Nordstrom in the 1980s. The ALF appliance uses the tongue ( “functional force” ) and strategic adjustments by the dentist to correct tooth crowding by producing a “light” outward force to promote jaw bone growth. A lip tie is also called a maxillary frenum. A lip tie is an attachment that connects the lip muscles to the upper jaw. When the connection is to close to the upper teeth or when it draws the lips too tightly up against the upper teeth, problems can be causes. Problems may include displacement of the teeth backwards, loss of gum tissue around the teeth and opening of a space in between the teeth – aka diastema. A maxillary frenum can usually be very easily removed without bleeding with a laser. ALF Dentist Appliance. a tongue tie is also called a lingual frenum. The tie is a connection between the tongue and the lower jaw. A strong lingual frenum can limit the range of motion of the tongue, deform the shape of the tongue in function. Usually a tie will cause the tongue to get pointy and taper on extension. Tongue ties can cause speech problems in kids, feeding problems for babies. The biggest problem with tongue tie is then tongue will not apply proper pressure to the jaw bones in a growing child. Less pressure leads to less bone growth and a smaller amount of room in the mouth for vital functions such as breathing, talking, eating, etc. Ultimately, tongue dysfunction can lead to sleep apnea and tmj problems. Tongue ties can be easily corrected with a laser. The procedure called a lingual frenectomy is usually done with minimal pain and no bleeding. After a lingual frenectomy, it is advisable to do some tongue exercises aka myotherapy.